Democrat Phil Bredesen gets support from 48 percent of likely voters, compared with 46 percent for Republican Marsha Blackburn. WASHINGTON — Democrat Phil Bredesen and Republican Marsha Blackburn are running neck and neck in Tennessee’s Senate contest, despite the state’s deep-red hue, according to a new NBC News/Marist poll of Tennessee. Bredesen, the state’s former governor, gets support from 48 percent of likely voters, while Blackburn, who is a current member of Congress, gets 46 percent. Only 5 percent of likely voters say they’re undecided. Among the larger pool of registered voters, Bredesen leads Blackburn by 4 points, 48 percent to 44 percent, but it’s within the survey’s margin of error. This is the third-straight NBC/Marist poll released this week — following surveys of Missouri and Indiana — showing competitive races that could very well decide control of the U.S. Senate in November. Democrats must gain a net of two Senate seats to flip control of the chamber, and Tennessee represents one of their best pick-up opportunities (after Arizona and Nevada). Bredesen and Blackburn are vying to succeed Sen. Bob Corker, R-Tenn., who decided not to run for re-election. Among likely voters in this Tennessee contest, Bredesen leads among Democrats (97 percent to 0 percent), African Americans (86 percent to 8 percent), women (55 percent to 40 percent) and independents (49 percent to 45 percent), while Blackburn leads among Republicans (86 percent to 9 percent), men (54 percent to 40 percent) and whites (53 percent to 42 percent). This NBC/Marist poll shows that Tennessee, which President Donald Trump won by more than 25 points in 2016, remains a solidly Republican state. The GOP enjoys a 12-point lead in congressional preference among likely voters, and Trump’s job rating is slightly above water — at 47 percent approve, 43 percent disapprove. 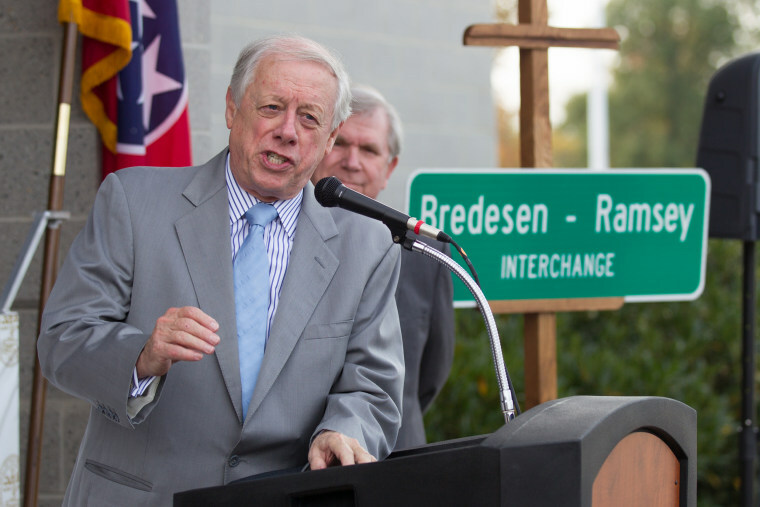 But Bredesen is staying competitive because of his popularity. Sixty-one percent of likely voters have a positive view of the former Democratic governor, versus 22 percent who have a negative view (+39). By contrast, Blackburn’s fav/unfav rating is 46 percent positive, 36 percent negative (+10). Meanwhile, Tennessee’s race for governor — to succeed term-limited Republican Gov. Bill Haslam — isn’t as competitive. Republican businessman Bill Lee holds a 13-point lead over Democrat Karl Dean, the former mayor of Nashville, 53 percent to 40 percent, among likely voters. Asked which issue will be the most important factor in deciding their vote, 27 percent of likely voters in Tennessee answered the economy and jobs; 20 percent said health care; and 13 percent said immigration. Asked their views raising tariffs, 43 percent said they hurt the economy by raising the cost of goods, compared with 30 percent who said they help the economy by protecting American jobs. And asked what message their vote for Congress will send, 48 percent said it would be for more Democrats to serve as a check and balance to President Trump, versus 46 percent who said it would be for more Republicans to help pass Trump’s agenda. The NBC/Marist poll of Tennessee was conducted August 25-28 of 940 adults (which has a margin of error of plus-minus 4.0 percentage points), 730 registered voters (plus-minus 4.5 percentage points) and 538 likely voters (plus-minus 5.1 percentage points). Respondents were contacted both by landline and cell phone.